I went out early yesterday morning with a friend to do some plein air painting. We drove around and found a beautiful old farm. The air was humid and the day grew hot but I found a nice place in the shade. Memo to self: put on more bug spray. The flies were biting. The couple who own the farm were most welcoming and invited us to help ourselves to drinks in the fridge. More often than not, painters are welcomed into most places. Of course, being a good neighbor and picking up after ourselves is important and we never leave any trash or dump chemicals. 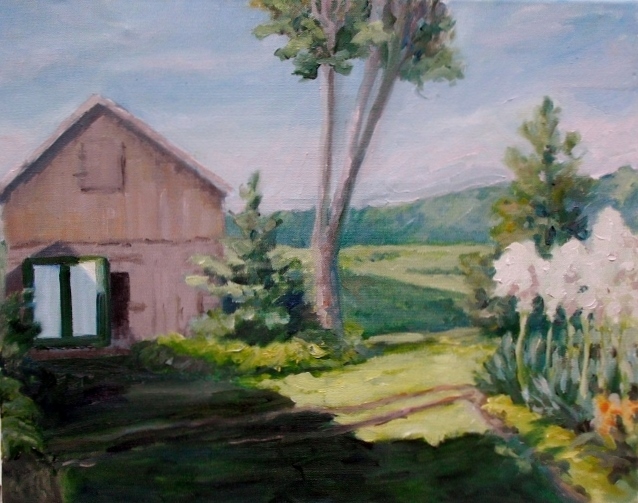 This entry was posted in art, plein air painting and tagged art, kit miracle, painting, plein air. Bookmark the permalink. A wonderful plein air piece :)) Time well spent, I wouldn’t mind going there either.